Melanie Santarelli ran the Chicago marathon when she was 10 weeks pregnant. 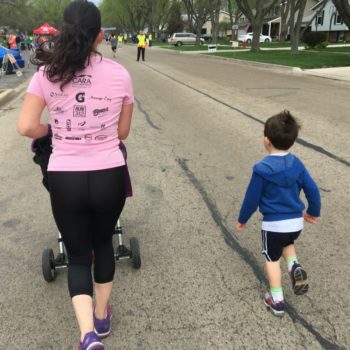 The accomplishment speaks to a toughness that Melanie learned from her own mother, Theresa, whose battle with cancer spurred Melanie to begin running. At 47, doctors diagnosed Theresa with stage four squamous cell cancer of unknown primary. Squamous cell lung cancer accounts for 30 percent of all lung cancers. After ruling other cancers out, doctors strongly suspected lung cancer. Theresa was a smoker for many years although she quit several years earlier on her 40th birthday. 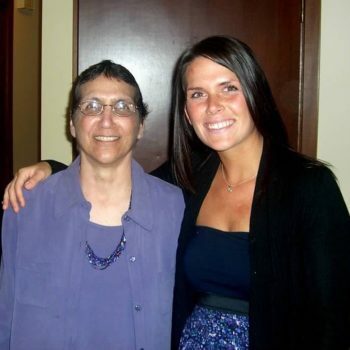 Melanie recalls her mother as healthy and active, and the cancer diagnosis came as a shock. Despite the diagnosis, Theresa continued her work as a family and child therapist, working long hours to help families in crisis. Melanie recalls that despite a mentally and emotionally demanding job, her mother always made time for her family. Theresa endured rounds of radiation and chemotherapy, always putting her family ahead of herself. She experienced terrible pain as the cancer spread and hindered her ability to walk. After three years of struggling, Theresa passed away, just four months before Melanie’s wedding. Melanie took up running as a way to process the loss. Theresa was a sprinter, and Melanie felt connected to her as she ran up and down Chicago’s lakefront. This year Melanie will run the Bank of America Chicago Marathon as a member of Respiratory Health Association’s Lung Power Team. The funds raised benefit the Association’s work to advance lung cancer research and help people quit smoking. Though this is her third marathon, Melanie continues to set the bar higher for herself and hopes to finish with a 4:20 time. During her most difficult training sessions, the memory of Theresa’s determination pushes her toward the finish. Now a mother herself, Melanie feels closer to her mother than ever. Whenever she runs, she mentally checks in with her mom and updates her on her life. To support Melanie Santarelli and lung cancer research, donate to her fundraising campaign.